The non-clinical spotlight series exists to shed light on all of the interesting paths that physical, occupational, and speech therapy professionals have taken. Today’s spotlight focuses on Lauren Hebert, PT, DPT, who went from physical therapist to MSD Prevention Consultant. Want to be featured on The Non-Clinical PT? Know of someone who’d be a great person to interview? Please reach out today! What did you do clinically after school, and for how long did you do it? At first, I was a clinical staff PT for University of Vermont faculty clinic contracts. Then, I became the Director of Rehab for a rehab agency in Wisconsin and Minnesota. I later wound up being PT director of a new hospital on the coast of Maine. After that, I went back to private practice, providing on-site treatment and ergonomics prevention services for several factories in Maine, which then led to operating several outpatient ortho PT clinics, plus work-injury prevention consulting. Along the way, I earned my OCS (in 1999), then renewed it in 2009. At what point did you go non-clinical, and why? With my work-injury prevention consulting firm, I eventually wound up serving more than 600 workplaces. I was running my consulting firm, but I also treated clinically in private practice for many (40!!!) years. I loved it until recently. Insurance company rip-offs have destroyed private practice and proper access to care overall, to the point that I realized I no longer wanted to operate in the traditional clinical model. I recently passed my private practice clinic on to staff, and I consider myself semi-retired. I’m now teaching work-injury management to DPT students and graduate PTs. I also became a registered Maine guide, specializing in bowhunting and wilderness fly-fishing expeditions. What compelled you to start your MSD prevention business? Watching patients get better, only to return to work was frustrating; I was discouraged watching patients get better, go back to work, and suffer a re-injury. I knew that workplace factors would almost guarantee they suffer recurrence of their problem. So, I followed a few back to their workplace, and discovered how obvious it was why they were were suffering these musculoskeletal dysfunctions; it was also apparent how obvious and easy the solutions were. I started modifying my clinic approaches to fit workplace in-services, which led to dramatic reductions in MSD. It also led to dramatic growth in demand for similar workplace education programs. How long have you been consulting for MSD prevention? I started prevention consulting work part-time in 1982, visiting a wide variety of workplaces. I would typically consult two days per week, and I’d fit those hours around clinic treatment days. What would a typical week be like when you do this type of consulting? It is a treat to say that each day is different! Mondays, Wednesdays, and Fridays are spent seeing patients in the clinic (which is fun since most patients are cousins in my hometown, and they get better with good manual PT care). 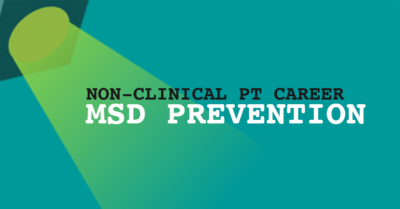 Learn more about this role in the MSD Prevention Specialist/Consultant career path article that Dr. Hebert generously wrote for this site! What are your favorite things about being a consultant? Marketing these services to workplace managers who have no clue (or highly distorted opinions) about what MSDs are and how to manage and prevent them. Did you need any special certifications or coursework for this role? Absolutely not. This work is wicked easy, utilizing the most basic of entry level PT musculoskeletal education on musculoskeletal function and dysfunction. What the patient needs is guidance on how to restructure and repackage their unique body of knowledge for application in the workplace for primary prevention. The most challenging part of this role is understanding how to grow and run the business itself; the clinical skills are easy. How to structure and present a workplace MSD SCHOOL to fit the client workplace. Reach out to me via private message if you’d like to learn more! My retirement plan is to empower as many PTs as I can to continue this work. What would you tell someone who is considering a similar path of such a varied career? Do you have any specific advice or recommendations? Come spend a day with me seeing it for yourself; consult my blog page at hebertphysicaltherapy.com, which is set up specifically to educate you on how to launch a similar consulting practice. Most of all: do not hesitate; seize the opportunity. I have been very successful by jumping into my new brainstorms without hesitation. Some failed, some succeeded bigly. You can survive most failures. Thanks for your insight, Lauren!